Printing - and in particular colour printing - featured in responses to the recent LRC user survey. Since we moved to the new campus two years ago, colour printing has been managed by our print-room provision through an external company called ServicePoint. Feedback, however, has usually highlighted the relative inaccessibility of this service and of course the prohibitively high colour print costs. Up until recently, colour printing in our type of environment has only really been feasible using colour laser technology and this has been expensive both to procure the devices as well as in the final cost per page. However, the manufacturer of our imaging equipment - Hewlett Packard - has developed a new technology called Edgeline that dramatically reduces the cost of the final output. As a result of this, we are undertaking a second trial of an Edgeline device this summer (the first trial earlier this year was unsuccessful) to ensure it operates within our infrastructure and we can use existing print accounts and smartcards to manage printing and copying on the device. We are hoping that this second trial will be more successful and if it is, we will deploy a device in the LRC for the coming academic year. All being well, costs for printing an A4 colour page will be dramatically lower than they currently are via the print-room. 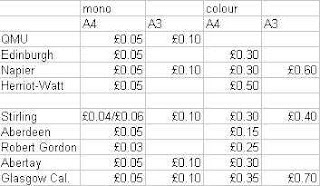 With the exception to colour printing described above, we intend to keep our print costs as they currently stand. Please think of the environment before choosing to print or copy a document. Remember, you can reduce print costs by half by printing 2 pages per side (equating to 4 pages per sheet of paper). You can also scan to email or your Z: drive from all our MFDs, rather than photocopy.